Home » animation , anthony and jessica rondina , art , awesome duuuuuuude , christianity , filmmaking , lego , north carolina » The Rondina Family: Brother and sister Christian filmmakers racking up awards with LEGO animation! The Rondina Family: Brother and sister Christian filmmakers racking up awards with LEGO animation! They work with a medium found at any typical Toys R Us... but their vision is as grand as Cecil B. DeMille's. Anthony and Jessica Rondina are a talented brother/sister pair out of Huntersville, North Carolina that got into animation with a high school project. A few more films under their belt and now their feature Jericho: The Promise Fulfilled is sweeping up film festival prizes and earning the duo widespread acclaim! 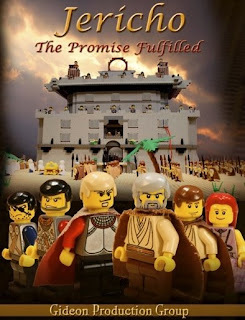 Christian-Movie.com interviews the Rondinas about their Gideon Production Group, how they animate with LEGO minifigures, their future projects and how they dedicate it all to God. And if you wanna see more of the Rondina pair's awesome work, mash down here for their official website!